9 Sponsored Communist Party "Jobs Bill"
After graduating from the Academy of Our Lady of Mercy, Lauralton Hall in Milford, DeLauro attended the London School of Economics and, in 1964, graduated with honors from Marymount College. Two years later, she received an M.A. in International Politics from Columbia University. Returning to New Haven, Rosa DeLauro campaigned door-to-door with her father and also became involved in community organizing, working with Frank Logue’s New Haven-based institute to train neighborhood volunteers for work in President Johnson’s War on Poverty and with the National Urban Fellows, an urban leadership development program seeking to create good job opportunities for minorities and women. Though she had never been involved in statewide politics, in 1979, Chris Dodd tapped DeLauro as campaign manager for his first Senate race. She was the first woman in Connecticut to run a statewide campaign, and she was so successful that Senator Dodd asked her to be his Chief of Staff, a role she held for seven years. During this time, DeLauro was diagnosed with Stage 1 ovarian cancer and underwent several months of radiation treatment before being declared cancer-free. Speaking to delegates from the 3rd CD, which she represents, Rep. Rosa DeLauro thankedd the labor movement for enabling her to win by large majorities. “With big margins I can take on the strong fights, which those with small margins many not feel free to do,” she said, referring to the vote against further funds for the war. 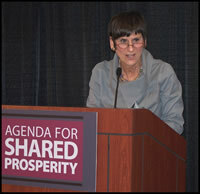 Congressional endorsers of the proposal included Rosa DeLauro. Signatories included Rep. DeLauro . The campaign was announced at a press conference on the steps of the Capitol. 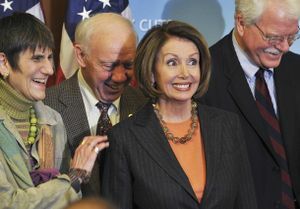 Leader Pelosi was joined by several members of the House of Representatives and leaders of many organizations that address issues of working women. 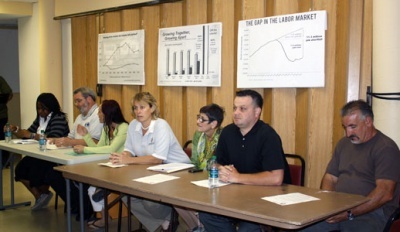 Amongst those present were the Coalition of Labor Union Women, the AFL-CIO, UFCW, the Feminist Majority, the American Civil Liberties Union, the National Women’s Law Center, the National Partnership for Women and Families, the American Association of University Women, the National Council of Women’s Organizations and others. In addition to Leader Pelosi, Congresswomen Rosa DeLauro (CT), Donna Edwards (MD), Nydia Velazquez (NY) and Doris Matsui (CA) participated in the press conference along with several women who told their stories. The campaign agenda focuses on policies that address real economic needs facing women and families: ensuring equal pay for equal work, promoting work and family balance, and providing access to affordable child care. Delegates to the 17th Coalition of Labor Union Women Biennial Convention, November 15th, 2013 in Reno, Nevada, endorsed the Family and Medical Insurance Leave Act (FAMILY Act), sponsored by Senator Kirsten Gillibrand of New York and Representative Rosa DeLauro of Connecticut, which would create a national paid family and medical leave insurance program to ensure people have much-needed income when family and medical needs arise. In 2010, DeLauro sat on the National Advisory Board of the Roosevelt Institute. The namesakes of the Institute are Franklin and Eleanor Roosevelt. Historical leaders of the Progressive movement. 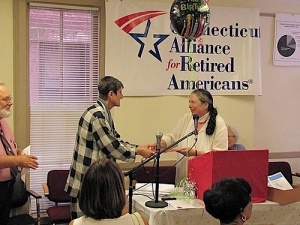 Rep. Rosa DeLauro attended the Center for Democracy in the Americas' 8th Anniversary Event, June 19, 2014. In 2014 Progressive Democrats of America assigned activists to deliver their material to almost every US Congressman and Senator, Shannon Clarkson, was assigned as the contact for Rep. De Lauro. In June it was Connecticut Communist Party leader Joelle Fishman. Signers of New York City Mayor Bill de Blasio's May 12, 2015 launched The Progressive Agenda to Combat Income Inequality included US Rep. Rosa DeLauro. New Haven Mayor Toni Harp announced her bid for a second term at a campaign kickoff event on a Saturday in early May 2015. U.S. Rep. Rosa DeLauro, the New Haven Democrat and powerful right hand to then House Speaker Nancy Pelosi, met with the Greater New Haven Peace Council for more than an hour this spring on the topic of Afghanistan. Peace council member Henry Lowendorf says DeLauro heard the group out but was not persuaded. "Achieving pay equality for women isn't enough," Senator Elizabeth Warren, said November 18, 2015 when she unveiled the Women's Economic Agenda developed by the Economic Policy Institute, a progressive think tank. "We have to make sure that all workers - men and women - are earning enough to live on." Elise Gould, EPI's senior economist, explained that "the same factors that have kept women's pay from growing over the last dozen years are the same forces that have suppressed wages for male workers." Wages for all workers have been suppressed, Gould said, because of national policies consciously adopted to guarantee that most of the wealth being created through increased productivity goes to those who are already the richest, most powerful people in America. In presenting the Women's Economic Agenda, Senator Warren pointed out that more than half of low wage workers are women and that some 14 million children are being brought up in poverty. "This is an economic issue," Warren said, "but it is also an issue of American values. No one who works full time should be living in poverty." Warren discussed her Schedules That Work bill. If passed (which is unlikely in today's Republican-controlled congress) it would prevent employers from calling workers in at the last minute. It would also stop managements from calling workers in, deciding they aren't needed and sending them home without pay. "Women especially need some control over their work schedules," Warren said, "because a large number have sole responsibility for children. How can you plan for childcare if you don't know what your schedule will be day to day?" U.S. Representative Rosa DeLauro, D.- Conn., said that along with scheduling allowing for family responsibilities, women also need paid family and medical leave. "Congressional representatives such as myself," DeLauro said, "can take off as many days as we want to. Yet, one quarter of all workers have been fired or threatened with being fired for taking just one day off to take care of their kids." EPI's economic agenda for women addresses the issues Sen. Warren and Rep. DeLauro discussed. It calls for equal pay that's also a living wage. It stresses the importance of fair scheduling and paid family and medical leave. "The surest way for workers to obtain these rights," said EPI President Lawrence Mishel, is to strengthen the right of workers to join unions and engage in collective bargaining." He added: "Women in unions are more likely to be paid higher wages and have access to needed benefits and protections. When unions are strong, those benefits and protections spread to nonunion workers as well." The agenda also calls for raising the minimum wage for all workers and eliminating the subminimum wage currently being forced on workers who earn tips. 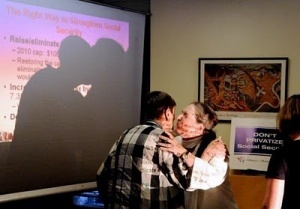 The agenda states that "More than half of elderly women are economically vulnerable," so it's vital that the nation protect and strengthen Social Security and pensions. Moreover, it states that "The United States must invest in early childhood education and more affordable child care." The agenda ends by calling for national monetary policies that "prioritize wage growth and very low unemployment." "I always get applause when I say I'm for equal pay for equal work," Senator Warren said. "But real economic equality and real economic equity will take real changes in America's economic policies. Liz McCarthy and Tyree Ford are two seniors from Southern Connecticut State University (SCSU) who will be joining others from around the nation and Connecticut on January 21 for the Women’s March On Washington. “Trump’s rhetoric is insulting, demonizing, and threatening to many women, immigrants, diverse religious faiths, native, Black and brown people, LGBTQ, and people with disabilities, and we must all come together in unity and solidarity to stop it!” said Ford, “The Women’s March on Washington is going to be the first of many organized rallies and marches that’s going to change things,” she added. She singled out four pieces of legislation key to the health and welfare of women, girls and families that she along with allies in Congress will fight for including saving health care and the Affordable Care Act, paid family and medical leave, gender pay equity, childcare assistance and the Violence Against Women Act. In Connecticut, 80 buses are headed to the nation’s capital with buses also going to smaller sister marches in New York, Hartford, and Stamford Connecticut on Saturday. “We’re expecting up to 200,000 people, and that’s just in D.C. alone, not to mention the sister rallies all throughout the country and all throughout the world. The numbers are going to be tremendous,” said McCarthy. The Women’s March idea began when Donald Trump was elected president. Rebecca Shook, a 60 year old retired attorney and grandmother from Hawaii went on Facebook and posted “Let’s March!” The post quickly went viral, a voice for many people who felt the election results were not legitimate. Soon after, assisted by her friends, Shook created an event page for the march, which was shared on the popular Facebook group Pantsuit Nation. Within less than 24 hours, 10,000 people had confirmed their attendance. Now, over 200,000 people will join Shook to march on Washington the day after the inauguration, including McCarthy and Ford. They will travel with several other SCSU students who are taking the drive down. Negotiations with the company at Porcelen SpecRail were not going well. The company refused to budge on wages, a retirement plan, or health insurance. The 66 painters union (IUPAT) members began wearing buttons to work listing their demands to show their strength. By February 20 2019 endorsers of Alexandria Ocasio-Cortez's HR 109 (Green New Deal) included Rosa DeLauro. This page was last modified on 18 February 2019, at 00:34.